When I think of the most efficient and effective form of upselling, grocery shopping is the first thing that comes to mind. It’s a personal problem of mind. I fall into their consumer-manipulating flow, buying extra (and usually unnecessary) items. It’s basically a form of upselling that visually, not verbally, convinces people to buy more. They merely present the customers with the opportunity and they make the decision on their own… Genius. Just this past weekend, I was on my way to watch the playoff games at a buddy’s house and went to the store to just buy a drink. Before I knew it, I was in the grips of their systematic layout and wandering down the chips and salsa aisle. “Who doesn’t like chomping on chips while watching a game.” I completely persuaded myself. A few minutes later I’m trying to balance an arm-full of frozen pizzas while palming the salsa in the other hand. Of course I didn’t have a basket because it wasn’t necessary when I entered the store. One drink doesn’t call for one. I’m assuming most of you are more savvy consumers than me. But it’s just another example of people’s willingness to be upsold. 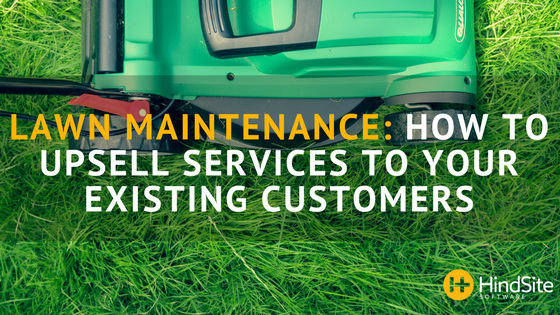 When it comes to lawn maintenance industry, your customers are just as acceptable to the same behavior. In 2013, Lawn and Landscape conducted a survey that showed 89% of customers don’t use their contractors for applying fertilizers, insect and weed control. Meaning they do it themselves or not at all. And 75% said they would likely buy treatment if their lawn maintenance contractor recommended it. It’s time to increase your jobs and build stronger customer relationships. You already provide the services, so it’s time to give the people what they want. Right customer, right time, right message (service): Just like selling to a new prospect, when upselling you should follow the same principles. To successfully sell someone anything it’s all about connecting with the right person, at the time they’re willing/ready to buy using a message the resonates with them and their situation. Keep customers Informed: Whether it’s a new service or it’s one you’ve been providing since day one. Giving customers the information they need to make a decision, puts the ball in their court. You’re being the least bit pushy and that’s something they will appreciate. The information can come in many forms, from a face-to-face conversation to an email or a postcard. The important part is that they have it and begin the decision-making process. Offer package and upgrade deals: It’s a strategy that most lawn maintenance businesses use, especially when it comes to selling to prospects. But when it comes to selling to an existing customer, you can make the package or upgrade more personalized to their situation. Let’s say you have customer that you mow, weed whack and trim hedges for. You can group together weed and insect control, fertilization and a one-time mulch insulation in a package with a reduced price. You now are providing them with almost double the amount of services. And if done properly they are much needed services. Easier than selling to new customers: The likelihood of selling to a new customer is 5-20%. 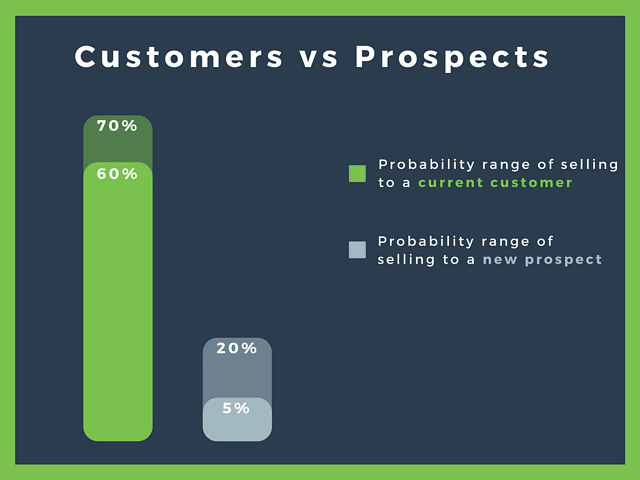 The probability of selling to an existing customer is 60-70%. Focusing on upselling just as much as you do with new prospects increases your business’s probability of achieving a sale. More efficient sales, means more money. Builds stronger relationships with your customers: By listening and providing a customer with a relevant and needed services, you’ll typically solve a problem for them and ultimately making their life better. What does this mean for your customer relationships? They end up trusting you and your judgment, building a stronger bond. Upselling doesn’t have to be a grimy word. If done properly the customer is benefiting just as much as your bottom line. And as you’ll it much easier than finding and selling to new customers.